Once you have mastered the art of hitting a golf ball what do you do when you venture out on to the golf course and your ball doesn't behave?? This section has been developed to give you the knowledge of what to do and how to behave in many different situations. The knowledge gained from this section will give you more confidence and improve your enjoyment of the game of golf. Rules and Etiquette is usually seen as a 'boring' part of golf and are often overlooked but they are very important and are closely linked to your enjoyment and performance when playing. Learning Rules and Etiquette was boring - until we developed a unique way of learning which is fun, and interactive. 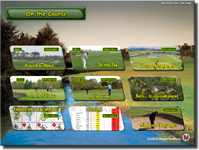 The quiz and information sections contain 130 different R&E scenarious, 88 incorporating video divided into four areas - General information; On the Tee; On the Fairway and On the Green. Balls…… in unusual places! 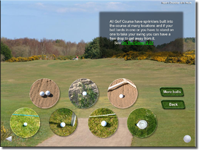 - Contains 36 photographs of golf balls in unusual places on the golf course, with explanations what to do if your ball lands here! It also uses hyperlinks to video and reference sections on other appropriate sections on the programme. Scoring - Different types of scoring methods explained in easy to understand language. Golf Language - Over 150 words and phrases used in golf, all explained in simple language..